Hi. I’m Kris Kish. 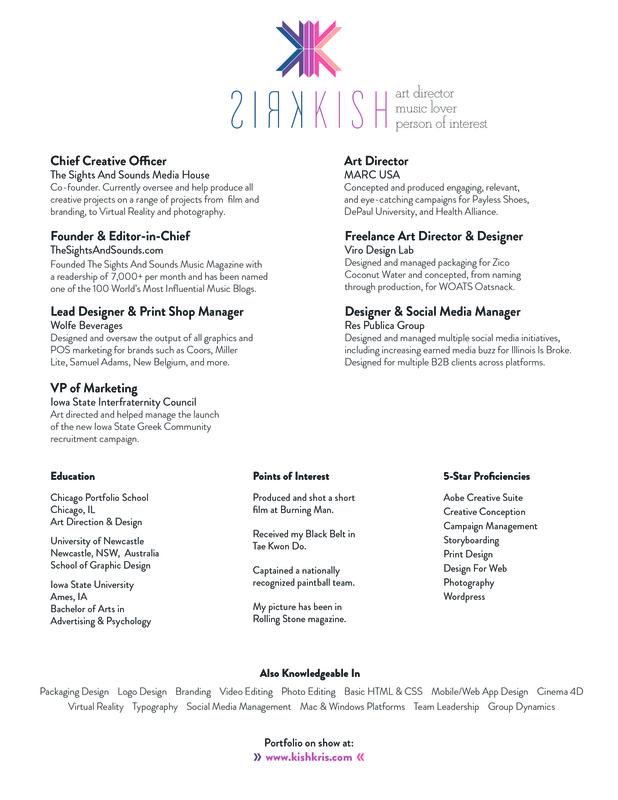 Art director, music lover, and person of interest. I take boring things and inject with them life. I also do other things. Fun and exciting things. Like one time I skydived (skydove?) Mt. Mordor. And just for kicks, I earned my Black Belt. It might sound crazy, but through my addiction to adventure and passion for spreading creativity, I have accumulated a skill set that not only meets and exceeds expectations, but does so in a fun-loving, easy going, and hard working package. I got my first deep dive and fell in love with design and art direction while living in Australia for a year. During my time in South Africa, I helped produce and shoot a proof of concept for a transformational travel documentary series. In Serbia, I was once paparazzi to Prince Charles and last year at Burning Man, I helped create their first fictional short film. Today, I live in the beautiful community of Venice Beach, CA where I’m fluent in Art Direction and Design (and the Hungarian language). In my spare time I am the Editor-in-Chief of The Sights And Sounds Music Magazine. I really do like coffee.